Homeowners looking to invest in something new are turning to the in-home sauna. With ease of installation, this is one affordable bit of luxury that everyone can enjoy at home. Here are three reasons to get an indoor sauna. Improved Health and Wellness Enjoy a cleansing sweat in your own personal sauna and reap the benefits of easy detoxification and increased blood circulation. Relieve achy muscles and joints from chronic pain and revive in minutes from the comfort and privacy of home. On-Demand Relaxation A sauna at home creates opportunities for being your best—whenever you need to be. Moms, dads, teens and anyone looking to escape the tension and stress of an active lifestyle, will appreciate access to soothing heat. Affordable Luxury With cost and installation reasonable, the sauna lifestyle can be yours, even on a budget. For modern families, adding an indoor sauna to the home is a smart, practical way to invest in health and happiness. To learn more about the benefits of owning a sauna, pick up a copy of our free buyer’s guide, Sauna Buying Made Easy. 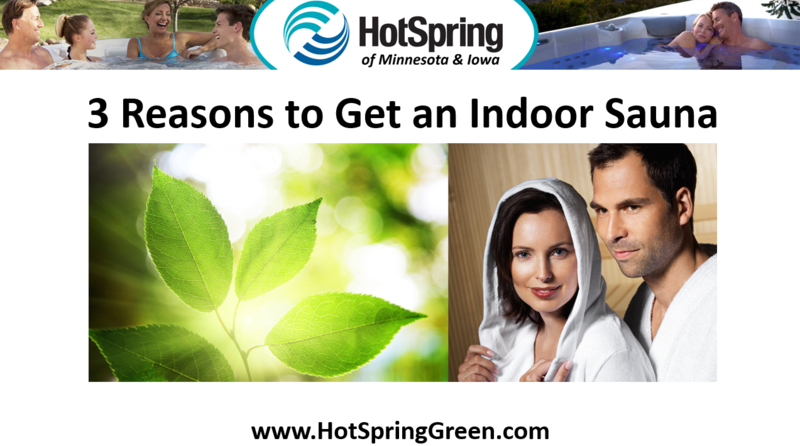 Just give us a call at ☎ 651-731-9745 or visit our website at: https://hotspringgreen.com/.